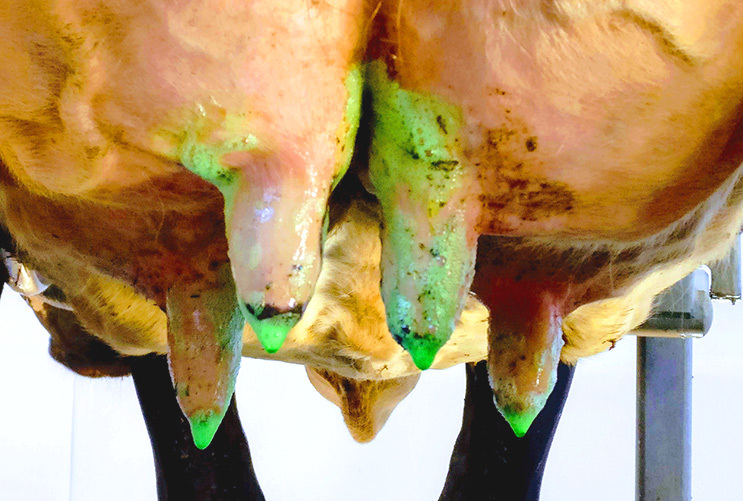 In this post we’ll talk about the importance of cleaning and disinfecting the udder before connecting the milking cluster to the animal. This simple step plays a key role in prevention of mastitis in dairy cattle. Discover here all the details about Forestripping and Predipping, two techniques which can definitely help you to detect the symptoms of mastitis and to reduce the contamination of teats. One of the first actions to be done once the cows are positioned in milking parlour is forestriping. Even though there is no global consensus on this, the practice of forestripping is recommended for the detection of abnormal milk and other symptoms of mastitis in dairy cattle. This procedure is done by manually removing a few strips of milk from each teat to detect signs of abnormal milk. Forestripping is recommended for detecting abnormal milk and other symptoms of mastitis in dairy cattle. Early identification of clinical cases of mastitis in dairy cattle helps to initiate adequate treatment protocols and also to divert this abnormal milk from the bulk tank, which is important for maintaining the bulk tank somatic cell count. Additionally, forestripping is also beneficial for the stimulation of teats during the pre-milking routine. It is estimated that manual stimulation of teats for 10 to 20 seconds is sufficient to induce a good milk ejection reflex for specialized dairy cows. The mammary gland of dairy cows is composed of secretory tissue based on alveolar structures containing epithelial and myoepithelial cells, and cisternal cavities and ducts. Before milking, the total milk volume within the mammary gland is distributed approximately 20 to 30% in the cisternal compartment and 70 to 80% in the alveolar compartment. During milking, cisternal milk is readily available for removal, but the alveolar milk is removed only after the contraction of myoepithelial cells in response to oxytocin stimulation. After the start of teat stimulation, oxytocin is released from the posterior pituitary into the blood circulation and reaches its maximum concentration 60 to 120 seconds after the beginning of tactile stimulation of teats. Therefore, in order to have an effective and full milk ejection reflex, teatcups should be applied to cows 60 to 90 seconds after the start of manual stimulation of teats. Good stimulation of teats before milking may improve milking performance, by increasing milk flow rates and reducing milking time, when compared to cows that have not been stimulated. After the Forestripping, next action will be predipping, with this action we want to clean disinfect teats and teat ends, so we can reduce the amount of bacteria present on the teat at the moment of attaching the unit, and avoid mastitis in dairy cattle. There is a direct relationship between hygiene procedures during milking, and bacterial counts of raw milk, and the incidence of clinical and subclinical mastitis in dairy cattle. A high bacterial count on teat ends is a major risk factor for new intramammary infections. When cows’ teats are exposed to a very dirty housing area there is an increased risk of new cases of mastitis of environmental origin. Therefore, disinfection of teats before milking helps to remove manure and mud and to reduce contamination of opportunistic pathogens that can cause mastitis and increase the total bacterial count of raw milk. The use of predipping of teats using an approved disinfectant is one of the most effective ways to reduce the contamination of teats. In order to achieve effective disinfection, the disinfectant solution should be allowed to remain in contact with teats for approximately 30 seconds, before adequate drying of teats. Forestripping and predipping are two milking procedures with a positive impact on milk quality, udder health and milking performance. Both procedures stimulate the milk let-down. The order in which forestripping and predipping are performed seems to make no difference in relation to the expected results. However, it is preferable to forestrip first and then to predip teats with a disinfectant solution, in order to reduce the chance of recontamination of teats by milkers’ hand. Washing teats should be done only when teats are visibly dirty, using a low-pressure clean water hose. Authors: Marcos Veiga (Professor of Animal Nutrition and Production at São Paulo University).